Spare a thought for the Curry Chefs of Brick Lane who carry on cooking through the festive season while everybody else puts their feet up. Like Bob Cratchit, these men only get one day off at Christmas, yet it is a measure of the all-consuming nature of their work that they did not seem unduly interested the possibility of a day’s break when I visited last week, rather they were passionate to maintain the ceaseless production of curry required daily to feed the insatiable appetites of their hungry customers. It was a year ago that I first began visiting the kitchens of Brick Lane to pay my respects to these unacknowledged curry heroes, and once the temperatures dipped again it was time to return in the company of Spitalfields Life Contributing Photographer Jeremy Freedman to make the acquaintance of more cooks and to extend the portfolio of portraits. Today I am publishing the complete gallery of pictures, revealing more faces of these reclusive men whose cherished duty it is to mix the spices and create the curry to sustain us all through the darkest depths of Winter. 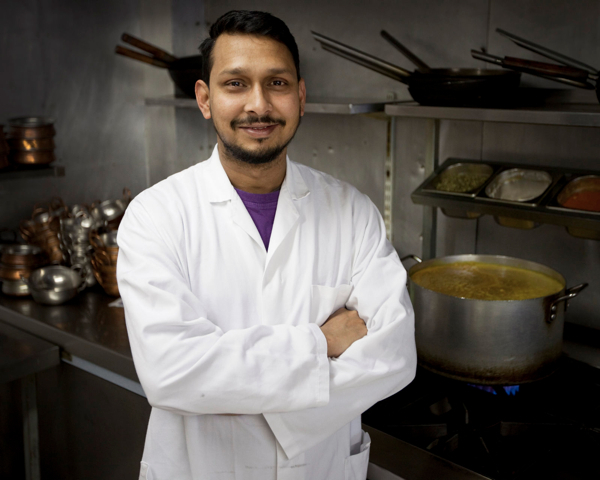 “When I started, I dreamed of being a chef,” confessed Jamal Uddin, Head Chef at Bengal Cuisine, referring to his ambition when he came here to Brick Lane from Bangladesh aged nineteen. 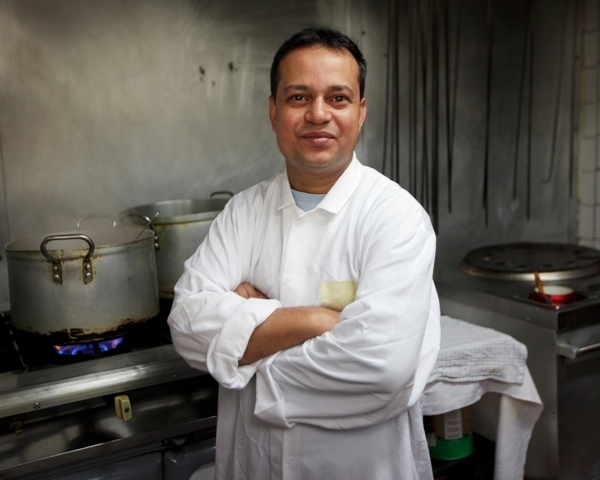 For the last fourteen years, Jamal has reigned supreme in his kitchen with a Tandoori Chef, a Cook and a Porter working under his supervision as he prepares as many as two hundred curries every day. “I love cooking,” he admitted to me as his gleaming face broke into a smile, though whether it was the intensity of his emotion or the humidity in the kitchen that was the cause of his glowing complexion, I never ascertained. 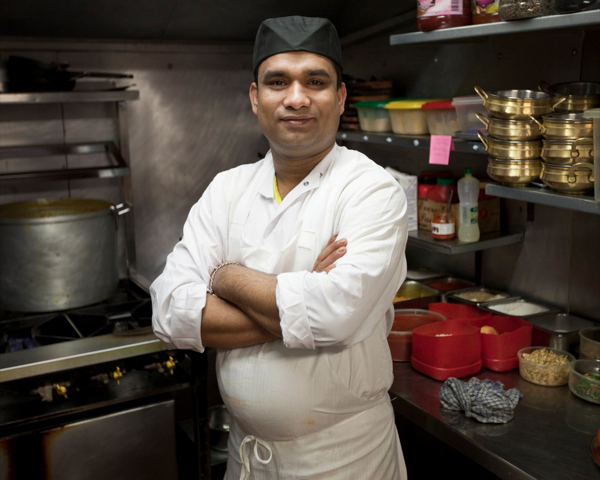 Syed Jahan Mir, Head Chef at Chillies Restaurant, told me he came to this country at the age of eighteen with his mother and father. 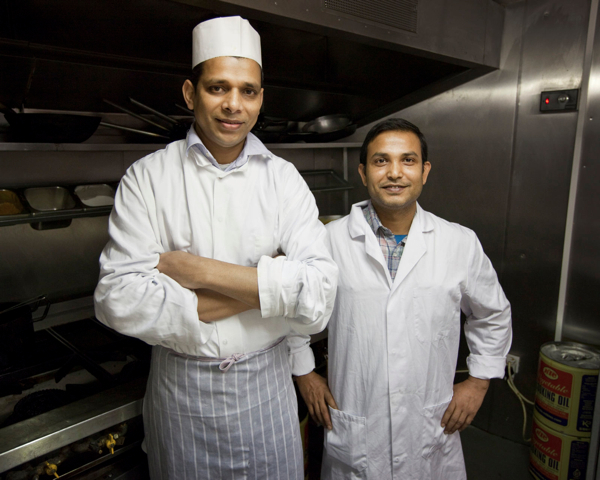 Syed was able to learn from his father who was also a chef and they started out together at first, working side by side in the same restaurant. “He’s better than me, but now he is retired to Sunderland I am the best!” Syed asserted, placing a hand on his chest protectively. “Of course I like it,” he confirmed for me with fierce pride, “Twenty-four years, I’ve been doing this, just making curry – it’s my profession.” A poet with spices, Syed creates his own personal mixture for curry. “It’s all the blending,” he emphasised, running his fingers through the golden powder in a steel dish to demonstrate its special properties. Mohammed Salik still remembers arriving in Britain at the age of seven. 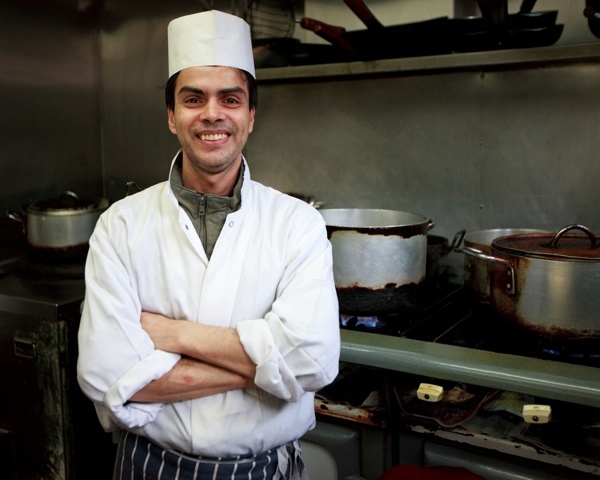 “It was quaint and nice here and the people so good, not overcrowded and dirty like my country,” he recalled with a sublime smile of reminiscence, “My dad used to work at the Savoy, but I wanted to be part of the community here in Brick Lane.” Starting as kitchen porter, Mohammed spent the first five years watching and learning and is now Head Chef at Eastern Eye Restaurant. Our brief conversation in the kitchen was eclipsed by the arrival of a bucket on a piece of string from the restaurant above and inside was a yellow slip of paper, occasioning a polite, apologetic glance from Syed as he turned away to study the handwriting and order his team to work, making up the order. At Cinnamon, Head Chef and veteran of twenty-five years in the business, Daras Miya was keen to introduce me to the two smiley, hardworking young Kitchen Porters under his care, skinny twenty-four year old Belal Ahmed who has been there three months and also works as a waiter, and nineteen year old Mizanor Rahman who started a week ago. Newly married and with little English, wide-eyed Mizanor was experiencing his first Winter in London, after marrying his wife who came from Britain to Bangladesh find a husband. In some establishments, Curry Chefs came to sit at tables to meet me. At others, I passed through the private door and descended the staircase – where incense sticks burned stuck in half a potato for stability – to reach the kitchen below. Here in these secret domains, the Curry Chefs work incessantly creating meals for customers they never see and who do not see them. Yet when required to face the camera, all the Chefs assumed the same gracious, arms-crossed posture without prompting. I never learnt the origin of this apparently innate piece of body language, which expresses perfectly their subtle balance of pride and modesty, both protective and assertive too. 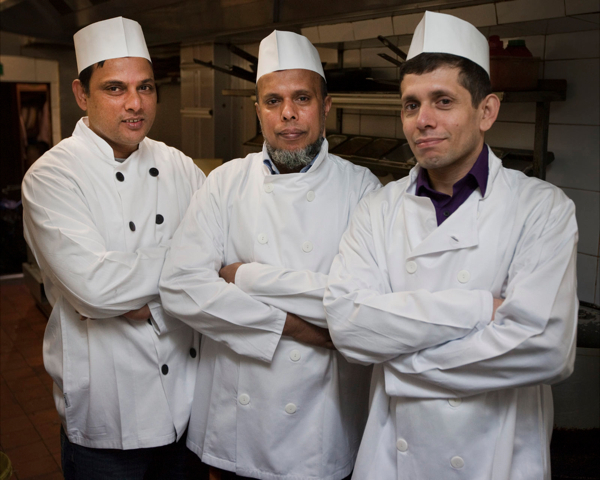 They present themselves to the camera with the dignified optimism which defines these brave men who began their lives in another continent and have embraced the role of Curry Chef as the means to further an existence in a new land . 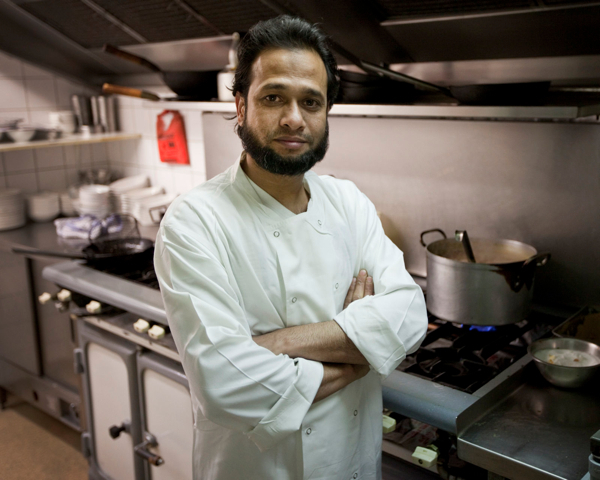 Jamal Uddin, Head Chef for fourteen years at Bengal Cuisine, 12 Brick Lane. 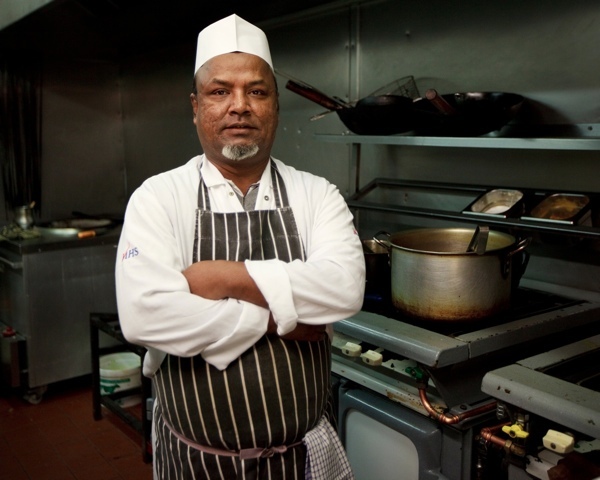 Zulen Ahmed, Head Chef at Saffron, 53 Brick Lane, for ten years. 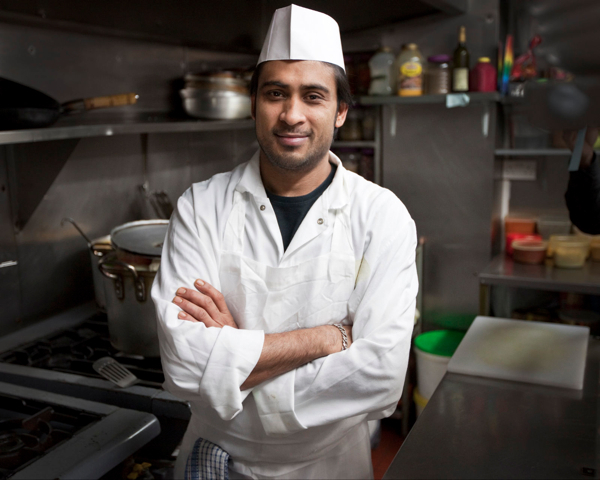 Syed Jahan Mir, Head Chef at Chillies Restaurant, 76 Brick Lane. 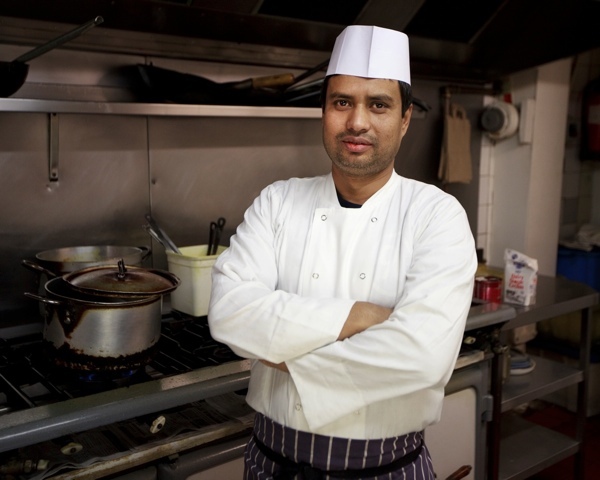 Mohammed Salik, Head Chef at Eastern Eye Balti House, 63a Brick Lane. Daras Miya, Head Chef at Cinnamon, 134 Brick Lane. 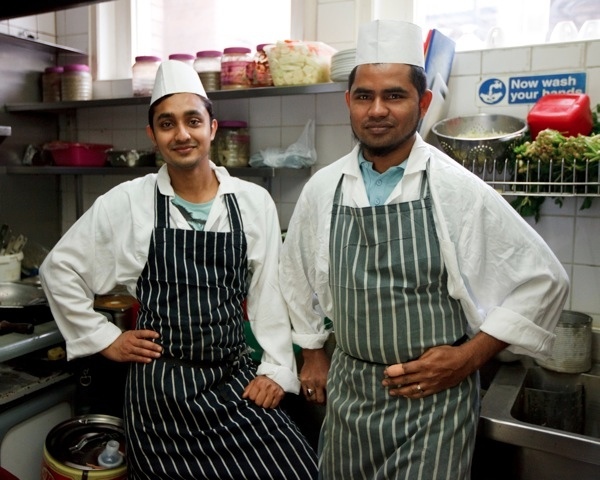 Belal Ahmed & Mizanur Rahman, porters at Cinnamon 134, Brick Lane. 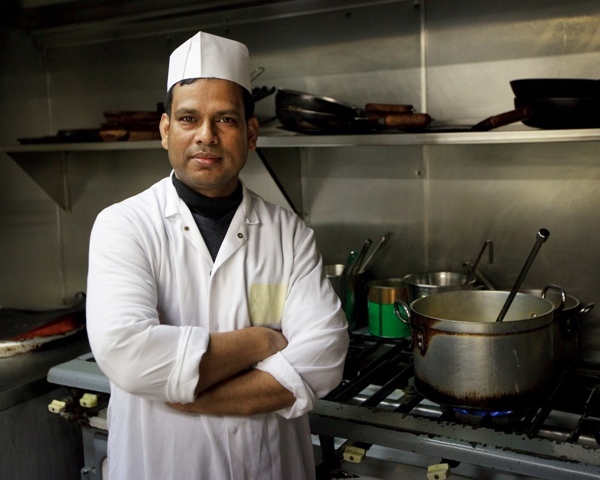 Jeremy Freedman’s portraits of The Curry Chefs of Brick Lane will be exhibited at Rich Mix from 23rd February until 31st March 2012.
spitalfields life could make a million dollarz <———–legit typo selling a t shirt that has UNACKNOWLEDGED CURRY HERO printed on it. i'd buy one. and wear it too. Look forward to the exhibition. Thank goodness for these guys giving us something else to eat over the festive period. I reckon they must be looking forward to unfolding their collective arms once the festive season is over. I live in Canada and have just read the article about your blog in my Guardian Weekly. I had to run to the computer to have a look. This was the first post I read. On my infrequent trips to London, my first order of business is to have a curry somewhere. Having been in the restaurant business myself for more than 20 years I too have spent many a day cooking while others have had their feet up. This is a wonderful website and I look forward to exploring it.